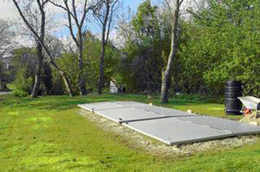 All systems in the range require a pre-settlement tank or septic tank prior to the BioKube. This removes the solids from the sewage water prior to treatment in the Biokube system. BioKube Venus is designed for single house use. BioKube Venus is designed to treat between 1000 and 2000 litres of sewage per day depending on the level of treatment required. 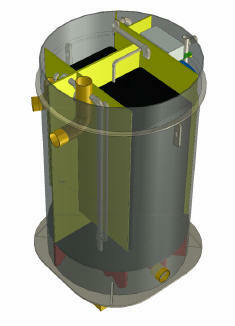 The dimensions for BioKube Venus are Ø 120 cm., Height 185 cm. and Weight 170 kg. 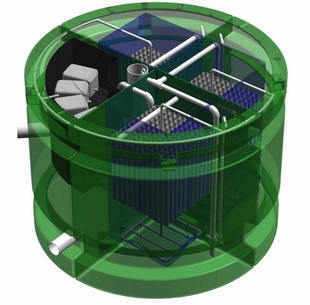 With a diameter of only 200 cm the BioKube Mars is very compact in size for a system designed to clean wastewater for 10 – 30 persons (2 – 8 houses) Again this is dependant on the level of treatment required. The dimensions for BioKube Mars are Ø 200 cm., Height 150 cm. and Weight 320 kg. If your septic system has failed due to soakaway failure, it is sometimes possible to upgrade your sewage system for free under your Buildings Insurance.